Not Dead Yet UK campaigners against the Assisted Suicide Lord Faulkner’s Bill at the House of Lord. 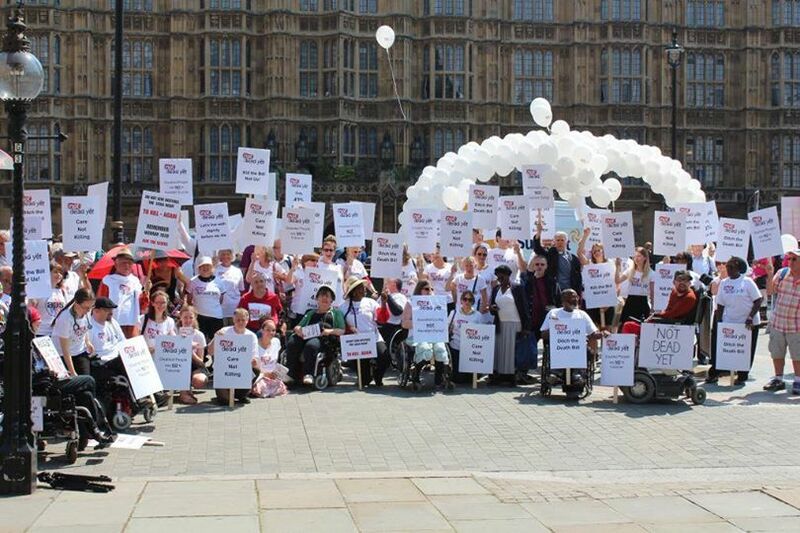 Sisters of Frida do not agree with Lord Faulkner’s Bill on Assisted Dying as disabled women. We asked Maria Zedda, member of the steering group, to write her own experience and thoughts on the Bill. I was asked to write something about the assisted dying bill and I wrestled with this thought as this is a subject touches me very closely. But briefly, I’m going to say that I had a beautiful baby sister who was a year younger than me. When she was born my mother kept telling the doctors how worried she was about her jaundice, she just looked too ill. The doctors told her not to worry and in twelve hours her jaundice worsened greatly, leaving her neurologically damaged, with Cerebral Palsy. She was a very fragile young child but brought so much joy with her smile, laughter and I remember her very well. The doctors kept making mistake after mistake in her care, giving contradicting advice, until one day my sister contracted pneumonia. She was kept in hospital but after a few days, she died. She was almost 3 years old by then. And my family were told that she was better off dead. Why? Because “she would not be suffering anymore”. This is what I believed for a long time. I resigned myself to the fact that she was indeed better off – and I learned to live with that hole in my soul. Then, I met my disabled friends, many of whom would be regarded as “severely disabled” by doctors and I’m not sure about this any more. The hole that my sister left seemed much bigger. After years of missing my sister and still not quite accepting her death fully, I asked myself when could anyone have the authority to decide when a life is worth living? Could it be that her death finally put an end to a series of mistakes by the doctors who thought “knew better” but actually didn’t? So many of my friends are “severely disabled” and “stunned doctors” and overcame all expectations”… even myself, after being diagnosed with 75 to 90% hearing loss, I was told I could not have a job and probably won’t be able to finish secondary school. At first this might not relate very much to Lord Falconer’s bill but in my view it does because I simply do not trust doctors or other medical “experts” to understand and interpret how disabled people, sick people and “terminally ill” people might feel and what we might be able to achieve. Although mostly they mean well of course, doctors do not always know better. At the lowest of our lows, when we are suffering, that’s when disabled, sick and very elderly people might actually want help living, not dying. I understand that many genuinely wish to die, absolutely. But unfortunately until all doctors are trained in the Social Model of Disability and understand that through Independent Living people can survive, be happy and thrive, then I cannot trust this bill to pass: there’s too much at risk. Disabled people are already victims of hate crime, stigmatised as scroungers and a burden on society, the risk is too great that they’ll feel pressurised to “unburden” their families, when actually Independent Living, appropriate care and support will help them thrive and contribute to society. Doctors don’t exactly have a good track record of understanding this. How can they be trusted to draw a line and decide when someone is genuinely asking for suicide assistance or are simply too low and desperate and need support and help? So I say NO to Falconer’s bill. After all, as Ghandi said “The true measure of any society can be found in how it treats its most vulnerable members”. And this thought, my dear sister, Anna Maria, is for you. There were many campaigners waiting outside while there were many speakers at the House of Lords for this debate on the 18th July, both for and against. My Lords, this is one of the most challenging moral issues of our times. On the one hand, we are dealing with the right to individual autonomy and to bodily integrity, and with the right to make decisions about our own lives. So it is a profound issue of human rights. On the other hand, there is the need to preserve the wider fabric of an ethical society with an overriding principle that human life is to be valued and guarded against violation and abuse. That is the bigger picture of sustaining the culture in which human rights, particularly those of the vulnerable, will be protected. This Bill, I have no doubt, is derived from good motives. I respect the aims of those who wish to relieve the suffering of people at the last stages of their life. But it is about respecting the individual. The conception of human rights that we have developed in Europe is different from that in America. We believe that it is not all about individual rights; it is about striking a balance with other rights and it is always about considering the impact on wider society. It is why we here find it so baffling that in the United States they cannot get control of their gun laws, because the individual right trumps the needs of the wider community. That is not so here. This Bill carries us unfortunately across a line. It takes us to a different place and to deny that is not right. I believe that it will change the moral landscape. The question is whether we are creating a climate of greater compassion or stimulating a climate of chillier decision-making. Are we raising the bar of humanity or are we creating a society where our ethics are made of coarser cloth? We could with good intentions be planting a seed that bears unexpected fruit, so that we end up with different calibrations about the quality of life and about humanity. What is exceptional today so easily becomes standardised tomorrow. Sometimes that is to the good, but sometimes it is to the bad. It is a fundamental principle of law that we should safeguard life—it is an absolute principle—and I think that it is too important for us to abandon it. Like the noble Lord, Lord Macdonald, I am concerned that this Bill creates immunity from inquiry, and I would like to hear more from the movers of the Bill about that matter. Is there to be no inquest after a death, so long as it ostensibly conforms to the Bill, with the forms filled and the consents secured? Is there to be no examination of the quality of the consent or the judgment of the doctors? Perhaps it is my experience as a criminal lawyer that makes me concerned about such total immunity from the processes of law and how the malign or reckless can misuse such processes. As the former Director of Public Prosecutions, the noble Lord, Lord Macdonald, said, these cases are currently examined. They cross the desk of not just any prosecutor but of the most senior in the land. In virtually every case nowadays, there is no action. However, it is important for people to know that there will be close consideration of the process and that there will be consequences for wrongdoing, because that is what prevents abuse. We must ask ourselves whether this legislation will lead progressively to other changes in end-of-life care that we would not want to see, even if we can decide when the end of life is imminent—and I question whether we are able to do that with much success. It is inevitable that the creation of powers of attorney will be the next step. We can be sure that people will say, “I’d like to be able to name a person to whom I will give a proxy consent, so that when I lose my faculties they can make the decision for me”. Many would want to see that happen. Like everyone, I am moved by the terrible stories of miserable ends. I think that sometimes doctors err too much on the side of caution in assisting the gentle passage of the dying because we have created a society laden with fear of accusation and litigation. We need to do more about the adequate training of all doctors in dealing with pain and death. Nor are we supporting doctors and nurses well enough as they make difficult decisions. Our medical world has been infected by a model of care that is increasingly commercialised. Reforms to our health and care system are reducing trust between patients and their carers—their doctors and nurses—and sometimes reducing compassion because there is so much pressure on the time of the carers. Relationships are built through consistency and time spent, as they were in the past when we had the GP whom we knew, rather than saw someone different every time, and there were teams who consistently worked together with sets of patients. However, I am afraid time is in short supply in our market-driven regimes. I share concerns about the pressure that we put on the aged and the disabled, expressed powerfully by many in this debate. I know that choice is the great aim of our age—choice in all things, as though we were all shopping. But who gets the choices? How many people in our communities have real choice? The issue of choice is a snare and a lure. I look around and I think that compassion is in short supply. Our society is becoming a harder place—harder on the elderly, the young, offenders, the unemployed and the poor. Society is full of people who have very few choices. We must be careful about creating huge moral changes when we see austerity policies already having such an impact on the disadvantaged. We keep being told that this is just a small step and we will not go further. However, I am afraid I am not so sanguine about our society’s sensibilities. I look around and see such cruelty to refugees and asylum seekers. I see what is happening to the destitute and the effect of cuts on the poor. I am not so confident that our expressions of altruism can be relied on into the future. I am not so sure that there is enough commitment to the vulnerable. Changing law is very important. Law is the bedrock of our nation; it is at its foundation. Some laws matter more than others, and this law will certainly matter. It speaks to who we are and how we want to be. Law is our national autobiography. There are good chapters and bad chapters. We should be very careful about what we are writing now. There was no vote, but the Bill now moves to Committee Stage. You can find more photos at this Flickr album.